The green sandpiper (Tringa ochropus) belongs to the family Scolopacidae under the order Charadriiformes. The Scolopacidae is the family of sandpipers, curlews and snipes. The family Scolopacidae was first introduced by Constantine Samuel Rafinesque-Schmaltz (October 22, 1783 – September 18, 1840), a zoologist, botanist, writer and polyglot, in the year 1815. The family Scolopacidae comprises fifteen genera, including genus Tringa. The genus Tringa was first described by Carl Linnaeus (23 May 1707 – 10 January 1778), a Swedish botanist, physician and zoologist, in the year 1758. "The genus name Tringa is the New Latin name given to the green sandpiper by Aldrovandus in 1599 based on Ancient Greek trungas, a thrush-sized, white-rumped, tail-bobbing wading bird mentioned by Aristotle". The genus Tringa comprises thirteen species, viz., Tringa ochropus, Tringa solitaria, Tringa brevipes, Tringa incana, Tringa erythropus, Tringa melanoleuca, Tringa nebularia, Tringa semipalmata, Tringa flavipes, Tringa guttifer, Tringa stagnatilis, Tringa totanus and Tringa glareola. The species Tringa ochropus was first described by Carl Linnaeus in the year 1758. The species Tringa ochropus is monotypic. Current topic in Birds of India: Green sandpiper - Tringa ochropus photos. The green sandpiper (Tringa ochropus) belongs to the family of snipes and sandpipers, the Scolopacidae. 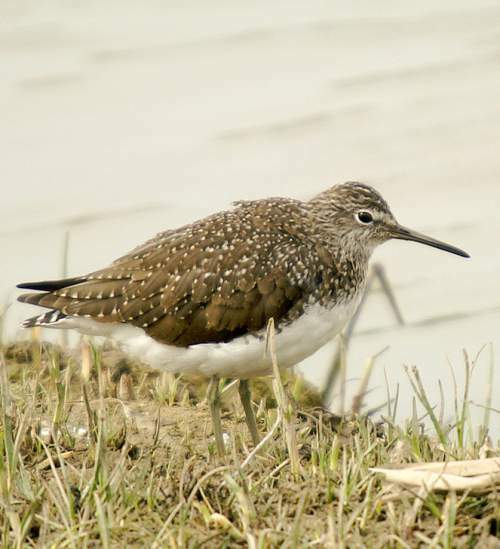 The green sandpiper species is distributed in subarctic Eurasia, southern Europe, tropical Africa, Arabian peninsula, Indian subcontinent and southeast Asia. These sandpiper species are fully migratory. These sandpipers are monotypic species. The green sandpiper (Tringa ochropus) is a medium-sized sandpiper, measuring 20 to 25 cm in length and weighing 50 to 120 grams. The wingspan is 55 to 60 cm. The head, back and upperparts are grayish brown. The rump is white. The foreneck, breast and upper flanks streaked gray-brown. The underparts are white. The back and wings have varying degree of white spots. There is white supercilium and dark brown lore. The bill is greenish brown with darker distal end. The irises are dark brown. There is a white eye-ring. The legs are greenish gray. 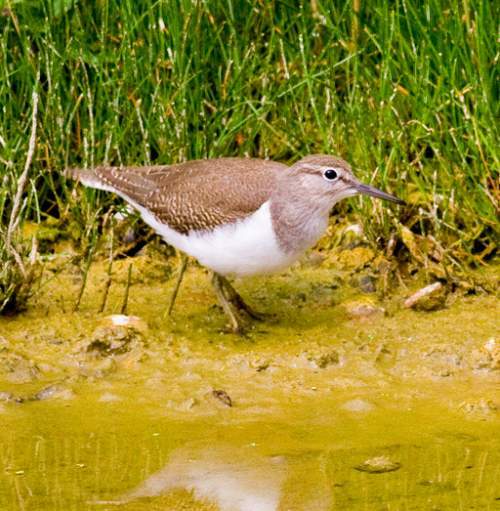 The call of these green sandpiper species is a characteristic three-note, sustained, melodious, whistling sound. These green sandpiper species are distributed in subarctic Europe, subarctic Russia, Kazakhstan, Kyrgyzstan, northern Mongolia, extreme northwest, southeast and northeast China, tropical Africa, Arabian peninsula, Indian subcontinent and southeast Asia. The Important Bird and Biodiversity Areas (IBA) of these green sandpiper species in Kazakhstan is Paradise Valley mountain plateau. 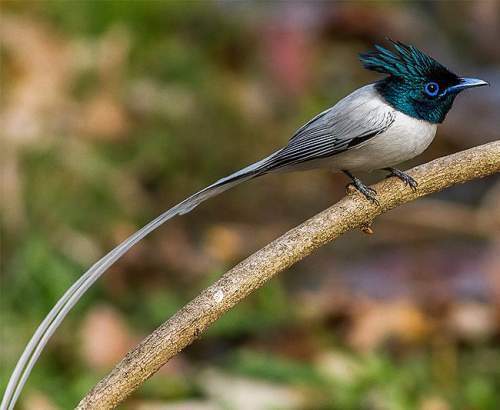 The IBA of these species in Brunei is Wasan. Some of the IBA of these sandpiper species in Russia are Watershed of the Mulym'ya and Bolshoy Tap rivers, Ust'-Ozerninskiye bogs, Russkoye lake, Ozersky pine forest, Kondo-Alymskaya, Kataiginskiye bogs, East slope of the Northern Ural and Forty islands. These green sandpiper species have medium forest dependence. They normally occur in altitudes from 0 to 2,500 meters. The artificial ecosystems and habitats of these green sandpiper species include cultivated lands, pasturelands, canals, drains, aquaculture ponds, flooded fields and rural gardens. The natural ecosystems and habitats of these sandpiper species include boreal forests, tropical and subtropical montane forests, flooded grasslands, wetlands, marshes, swamps, freshwater lakes, rivers, streams and creeks. 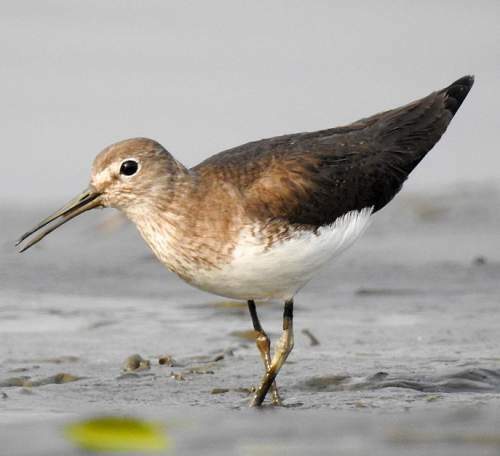 The diet of these green sandpiper species consists mainly of invertebrates. Aquatic and terrestrial insects, insect larvae, annelids, small crustaceans, spiders and fish are their primary food. 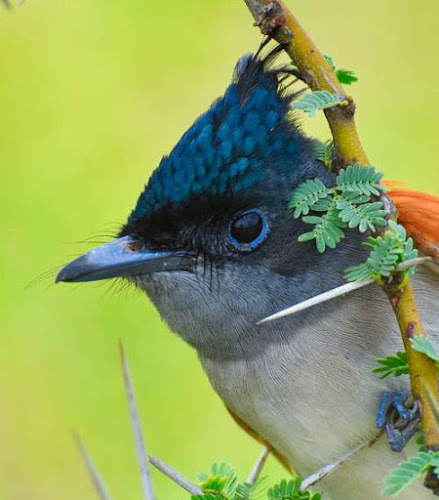 These species locate the prey by sight and also by probing the ground with their long bill. They glean the prey from moist surface or probe the wet ground and shallow waters for prey. The breeding season of these green sandpiper species is from April to June in most of their breeding ranges. These species are monogamous and highly territorial. The sandpiper nesting sites are located high up on trees in montane forests, boreal forests and pine forests. These green sandpipers nest in the abandoned nests of passerine birds and in natural platforms. The clutch contains 2-4 pale buff colored eggs with dark patches. Both the parents incubate the eggs. The chicks hatch out after 21 days of incubation. 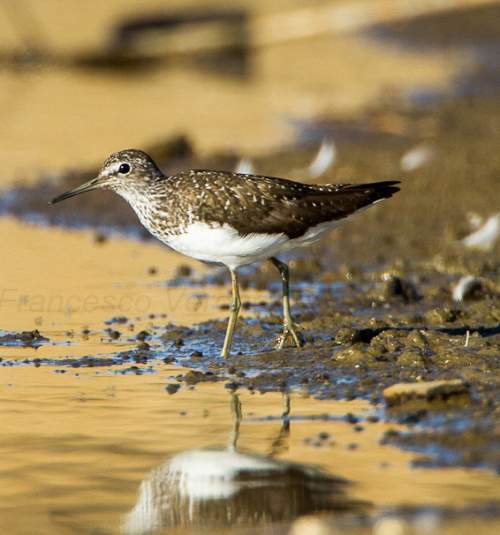 These green sandpiper species are fully migratory birds. The breeding populations occur across subarctic Europe and Asia, Kyrgyzstan and extreme northwest China. The southward migration to wintering grounds takes place from late-June to October. 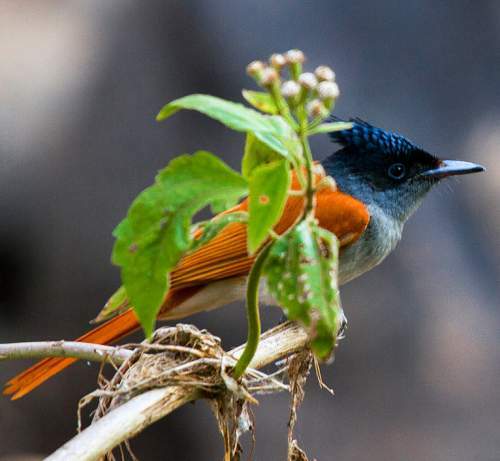 These species spend their winter in tropical Africa, Arabian peninsula, Indian subcontinent and southeast Asia. They return to the breeding grounds between February and mid-May (Urban et al. 1986, del Hoyo et al. 1996). The global population size of the green sandpiper (Tringa ochropus) is estimated to number about 1,200,000 to 3,600,000 individual birds. The overall population trend of the species is considered to be increasing. 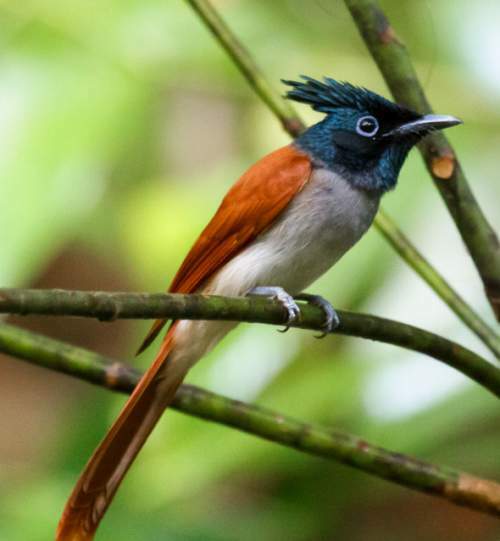 In most of its range, this species is reported to be common to uncommon. The generation length is 5.6 years. Its distribution size is about 24,600,000 sq.km. Habitat alteration and destruction, agricultural expansion, loss of wetlands, human intrusions and disturbance, hunting and susceptibility to avian influenza are the main threats that are endangering the survival of these sandpiper species. 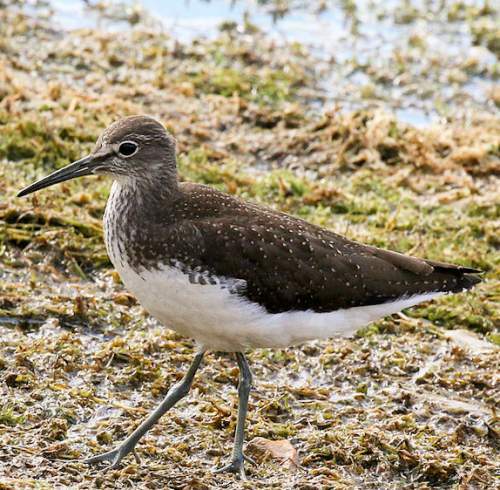 The green sandpiper (Tringa ochropus) does not approach the thresholds for being Vulnerable, either under the range size criterion, or under the population trend criterion or under the population size criterion. The IUCN (International Union for Conservation of Nature) has categorized and evaluated the sandpiper species and has listed it as of "Least Concern". 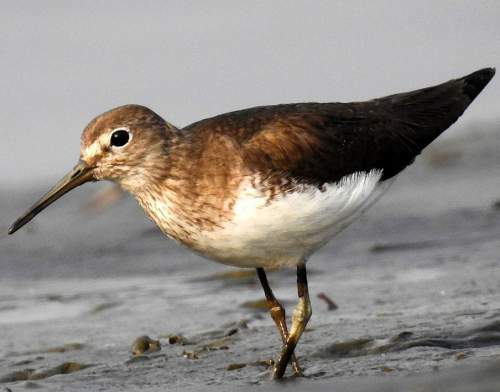 The CITES (Convention on International Trade in Endangered Species of Wild Fauna and Flora) status is ‘Not Evaluated’ for the green sandpiper (Tringa ochropus). The green sandpiper (Tringa ochropus) is closely related to the solitary sandpiper (Tringa solitaria). Formerly green sandpiper was considered conspecific with solitary sandpiper (T. solitaria) of North America. Current topic in Birds of India: Green sandpiper - Tringa ochropus. The lesser sand plover (Charadrius mongolus) belongs to the family Charadriidae under the order Charadriiformes. The Charadriidae is the family of dotterels and lapwings. The family Charadriidae was first described by William Elford Leach, MD, FRS (2 February 1791 – 25 August 1836), an English zoologist and marine biologist, in a guide to the contents of the British Museum published in 1820. The family Charadriidae comprises two subfamilies, Vanellinae and Charadriinae. The subfamily Charadriinae was first introduced by William Elford Leach in the year 1820. The subfamily Charadriinae comprises eight genera, including genus Charadrius. The genus Charadrius was first described by Carl Linnaeus (23 May 1707 – 10 January 1778), a Swedish botanist, physician and zoologist, in the year 1758. 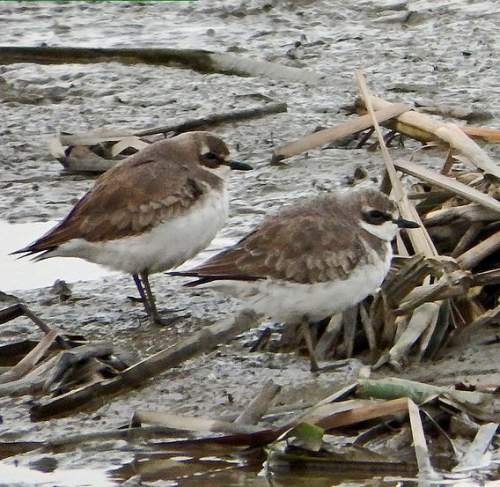 The genus Charadrius comprises 31 species, including Charadrius mongolus. The species Charadrius mongolus was first described by Peter Simon Pallas FRS FRSE (22 September 1741 – 8 September 1811), a zoologist and botanist, in the year 1776. Current topic in Birds of India: Lesser sand-plover - Charadrius mongolus images. The lesser sand plover (Charadrius mongolus) belongs to the family of lapwings and plovers, the Charadriidae. 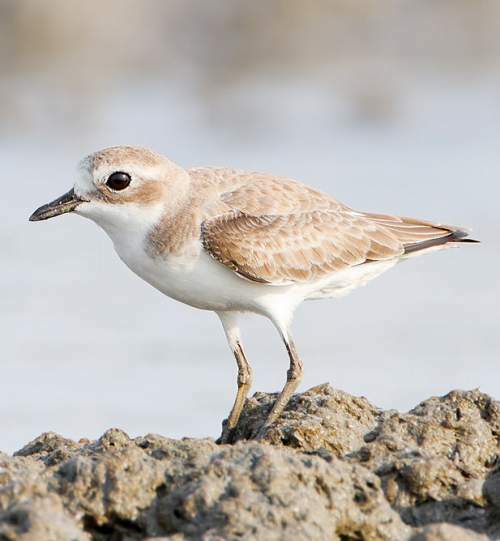 The lesser sand plover species is distributed in Africa, Arabian peninsula, Indian subcontinent, southeast Asia, Australia, China and northeast Russia. These plover species are fully migratory. 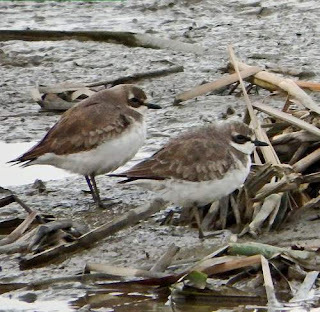 These plovers are polytypic species. The lesser sand plover (Charadrius mongolus) is a small to medium-sized plover, measuring 17 to 22 cm in length and weighing 40 to 110 grams. The wingspan is 45 to 60 cm. The breeding male lesser sand plover has gray-brown crown, nape and upperparts. The sides of the neck and hindneck are chestnut. A broad black mask extends from the base of the bill to ear coverts, passing through the eyes. There is a dark brown stripe above the forehead. The underparts are white. The female lesser sand plover has dark grey-brown or rufous mask. There is no dark stripe on the forehead. In non breeding plumage, the black and chestnut marks become gray-brown. The bill is black. The irises are dark brown. There is a white eye-ring. The legs are dark gray. The call of these lesser sand plover species is a short, hard "drrrit" or a hard trilling sound. These lesser sand plover species are distributed in eastern coastal Africa, south coastal Arabia, coastal Indian subcontinent, coastal southeast Asia, coastal Australia, Himalayan region, central Asia, central and western China and eastern Russia. The lesser sand plover nominate subspecies C. m. mongolus is distributed in far east Russia and winters in Taiwan and Australia. The subspecies C. m. schaeferi is distributed in south Mongolia and central China. It winters in Thailand and Indonesia. The lesser sand plover subspecies C. m. atrifrons breeds in Himalayas and southern Tibetan Plateau and winters in India and Indonesia (Sumatra). The lesser sand plover subspecies C. m. pamirensis breeds in central Asia and winters in Africa and western India. 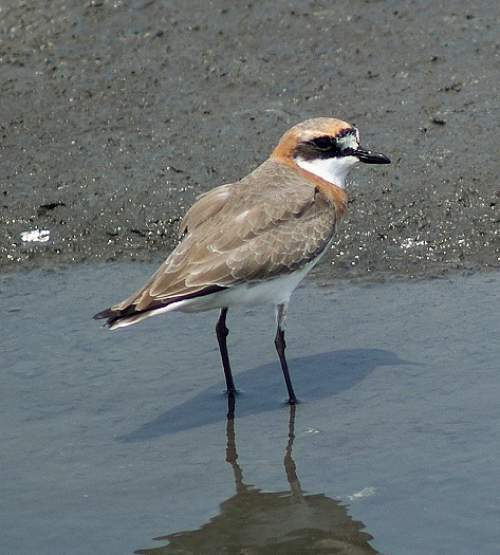 The plover subspecies C. m. stegmanni is distributed in northeast Siberia and winters in Taiwan, Philippines, Papua New Guinea and surrounding islands and Australia. The Important Bird and Biodiversity Areas (IBA) of these lesser sand plover species in Australia are Great Sandy Strait and Gulf Plains. The IBA in China are Laizhou Wan, Yalu Jiang Estuary and Ulungur Hu and Jili Hu. The IBA of these lesser sand plovers in India are Mahul - Sewri Creek and Kaliveli Tank and Yeduyanthittu estuary. The IBA in Russia are Aniva bay, Tyk and Viakhtu bays, Nevskoye Lake, Ola lagoon and North-east Sakhalin lagoons. 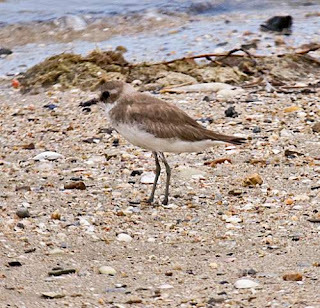 The IBA of these plovers in United Arab Emirates are Marawah Island, Khor Al Jazirah, Khor Al Beidah, Bu Tinah and Ba Al Ghaylam. 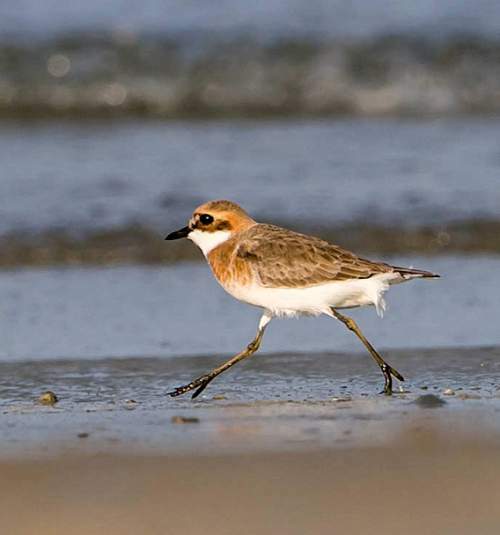 The IBA of plovers in Saudi Arabia are Tarut Bay, Sabkhat al-Fasl lagoons, Jizan Bay and Farasan Islands. These lesser sand plover species have low forest dependence. They normally occur in altitudes from 0 to 5,500 meters. The artificial ecosystems and habitats of these species include cultivated lands. The natural ecosystems and habitats of these lesser sand plover species include tundra grasslands, high altitude grasslands, wetlands, swamps, marshes, estuaries, tidepools, intertidal mudflats, beaches and coastal dunes. The diet of these lesser sand plover species consists mainly of invertebrates. Molluscs (mostly bivalves), polychaete worms, crustaceans like crabs (del Hoyo et al. 1996) and amphipods and insects (beetles, insect larvae) are their primary food. These lesser sand plover species locate the prey by sight. They glean the prey from moist surface or probe the wet ground for prey. They mostly use the typical run-stop-peck method of feeding. The breeding season of these lesser sand plover species is during May and June in most of their breeding ranges. These species are monogamous and highly territorial. The sand plover nesting sites include, plains above the tree-line on mountains, elevated tundra and mountain steppe, dry edges of salt-marshes and shingle beaches. The lesser sand plover's nest is an unlined shallow scrape on the ground. The clutch contains three eggs. The eggs are incubated by both the parents. The chicks hatch out after 22-24 days of incubation. The hatchlings are precocial and fledge after 30–35 days. These lesser sand plover species are fully migratory birds. The breeding populations occur in northern range of their distribution. The adults leave the breeding grounds by August, followed by the juveniles in September. These plovers migrate southwards for wintering. The return migration to the breeding grounds occur in April and May. 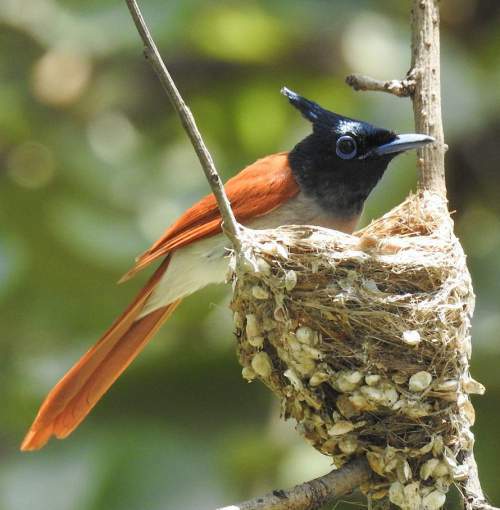 One year old birds often remain back in the wintering grounds (Hayman et al. 1986, del Hoyo et al. 1996). 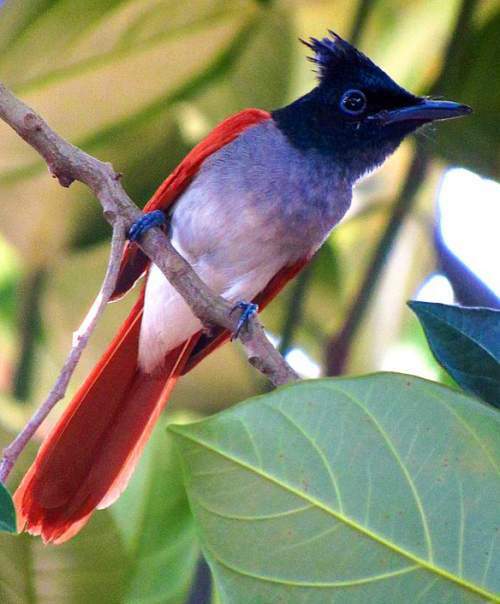 The subspecies have different breeding and wintering ranges. The global population size of the lesser sand plover (Charadrius mongolus) is estimated to number about 310,000 to 390,000 individual birds. The overall population trend of the species is not known. 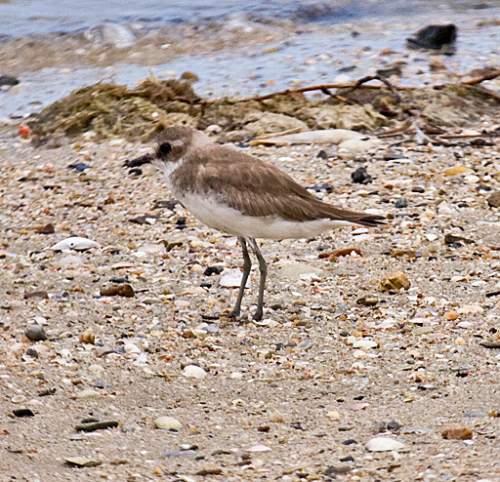 In most of its range, this plover species is reported to be common to uncommon. The generation length is 5.2 years. Its distribution size is about 47,100,000 sq.km. Habitat alteration and destruction, agricultural expansion, loss of wetlands and human intrusions and disturbance are the main threats that are endangering the survival of these plover species. The lesser sand plover (Charadrius mongolus) does not approach the thresholds for being Vulnerable, either under the range size criterion, or under the population trend criterion or under the population size criterion. 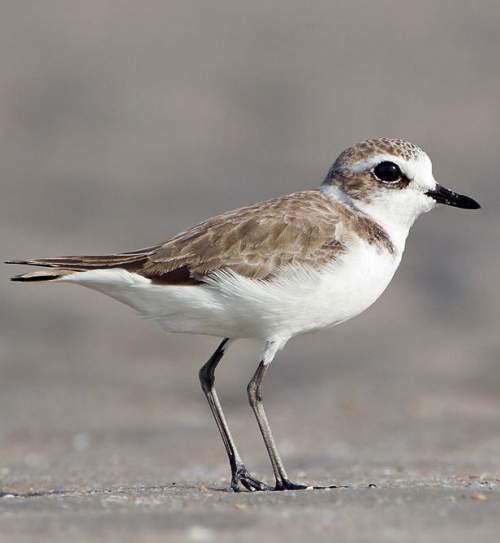 The CITES (Convention on International Trade in Endangered Species of Wild Fauna and Flora) status is ‘Not Evaluated’ for the lesser sand plover (Charadrius mongolus). The five recognized subspecies of the lesser sand plover (Charadrius mongolus) are: C. m. mongolus Pallas, 1776, C. m. schaeferi Meyer de Schauensee, 1937, C. m. atrifrons Wagler, 1829, C. m. pamirensis (Richmond, 1896) and C. m. stegmanni Portenko, 1939. Current topic in Birds of India: Lesser sand-plover - Charadrius mongolus. 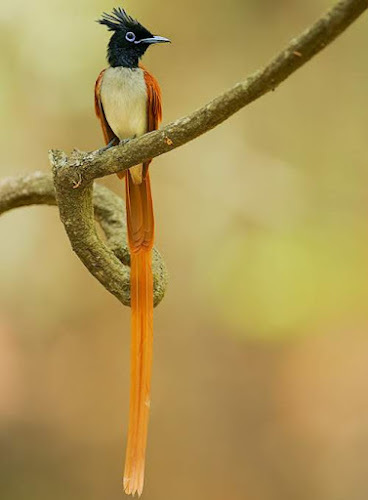 The Indian paradise flycatcher (Terpsiphone paradisi) belongs to the family Monarchidae under the order Passeriformes. The family Monarchidae comprises about 100 monarch passerine birds. The family Monarchidae was first described by Charles Lucien Jules Laurent Bonaparte (24 May 1803 – 29 July 1857), a French biologist and ornithologist, in the year 1854. The family Monarchidae comprise two subfamilies, Terpsiphoninae (four genera) and Monarchinae (12 genera). The subfamily Terpsiphoninae comprises four genera, viz., Hypothymis, Eutrichomyias, Trochocercus and Terpsiphone. The genus Terpsiphone was first described by Constantin Wilhelm Lambert Gloger (17 September – 30 December 1863), a German zoologist and ornithologist, in the year 1827. 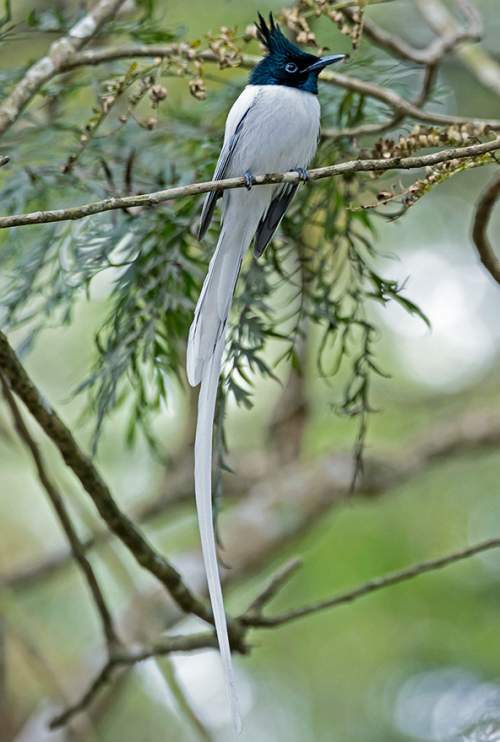 The genus Terpsiphone comprises sixteen species, including Terpsiphone paradisi. The species Terpsiphone paradisi was first described (as Corvus paradisi) by Carl Linnaeus (23 May 1707 – 10 January 1778), a Swedish botanist, physician and zoologist, in the year 1758. 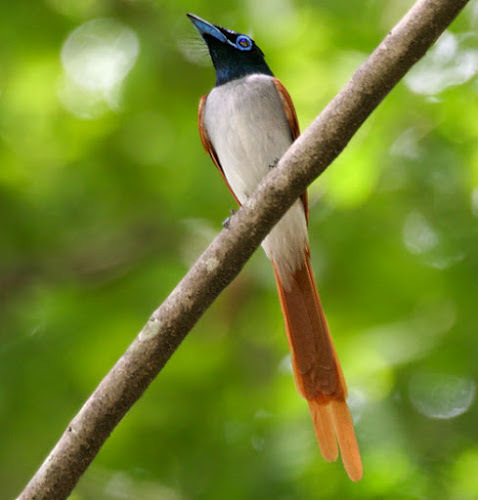 Current topic: Indian paradise flycatcher - Terpsiphone paradisi images.